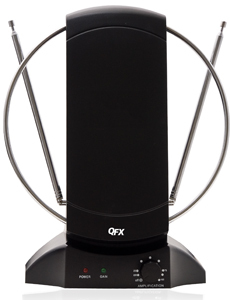 FREE TV FOR LIFE - Never Pay Your Cable or Satellite For Television Again! You Can Get All Local Crystal Clear Channels Absolutely Free! The ANT-101 can pull in all of your local news, weather, sitcoms, kids and sports programming with NO monthly contract or bills. Just plug it in and connect to your television and let the antenna do all the work. 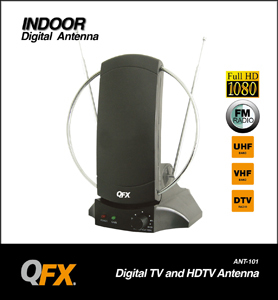 The QFX ANT-101 provides full-band DTV/VHF/UHF/FM reception while the built-in motor rotates up to 90° for optimal reception at 1080p, 1080i, and 720p resolution—allowing owners to view digital channels on their HDTVs in stunning detail, vibrant colors, and sharp contrast.